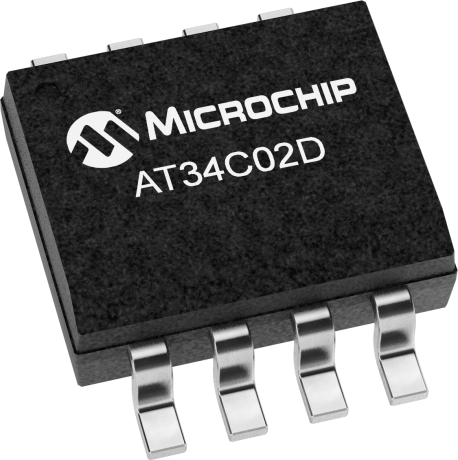 The Microchip AT34C02D is a 2 Kb Serial EEPROM utilizing an I2C (2-wire) serial interface. The device is organized as one block of 256 x 8 and is optimized for use in consumer and industrial applications where reliable and dependable nonvolatile memory storage is essential. The EEPROM is available in a variety of space-saving packaging options. The AT34C02D is designed to support the JEDEC EE1002 and EE1002A Serial Presence Detect (SPD) function used in DDR, DDR2, and DDR3 Dual Inline Memory Modules (DIMM). In order to comply with this standard, the device includes a software write protection feature for the lower 128 bytes of the EEPROM that can be made permanent.